Scientists have recognized more than 300 Octopus species. They live in the oceans around the world. They are only found in salt water and they can live in regions that are either warm or cold. They range in size from extremely small to quite large. There is plenty of misunderstanding out there about these animals. The structure of their bodies with very large heads and eight legs going in all directions can be unnerving to some. You have to agree that the design of their anatomy is unlike any other creature in the world. They are extremely flexible too which is really neat because they can make the shape of their body to fit anything, even inside of a bottle lying on the ocean floor. In many cultures they are deemed as evil creatures that lurk at the bottom of the water. They are said to be waiting for ships to destroy and men to drag under the water to kill. However, they are virtually harmless to humans and have no desire to be in confrontations. In fact they prefer to run and to hide when they feel that they are in any type of danger. 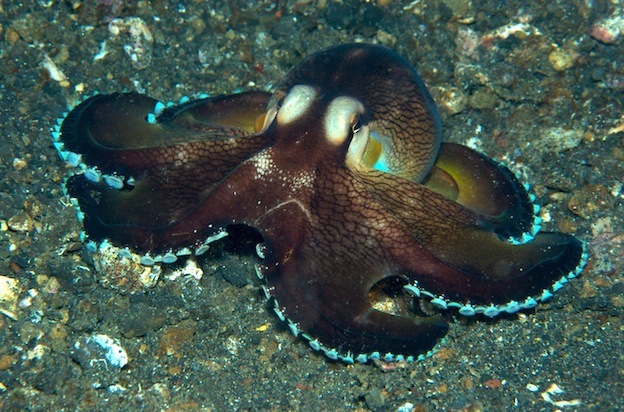 All Octopus species consume crustaceans, mollusks, and fish. The majority of their food sources have shells on them. They will use their beaks to break the shells and consume the insides of them. When they can’t do that because of a very hard shell they will release a toxin from glands in their body. This toxin will dissolve the shell quickly and they can get to the source of the food. All species of Octopus hunt at night and they have amazing vision. During the day they spend their time relaxing and hiding from predators. They have the ability to change their pigment so they can blend into surroundings. That’s right, they can hide in plain sight at times because they look just like what they are against. It can be hard to study these animals in depth due to their location. They don’t do well in captivity though so that creates an additional burden. They are well known to be very intelligent animals though. They are also consumed by people all over the world as a great type of food. Sometimes they are the main course and other times they are a side dish such as Octopus rice. All of the species of Octopus have a very short life span so they have to mature rapidly. Some have a cycle of life, reproduction, and death in less than a year. On average they won’t live more than five years. Experts believe their bodies are predispositioned to shut down after they mate. That urge to mate is one that is instinct driven and they can’t avoid. The number of eggs that can be deposited can be up to 200,000. It really depends on the size of the Octopus and the species. The reason why they have so many eggs is that very few of them will be able to survive to maturity themselves. Octopus are very interesting animals and they give us plenty to think about. There are quite a few differences among the species of Octopus out there. If there is a particular one you are interested in you can find photos of them and information about their lives. It can be fun as well as educational to explore many of the different species in great detail. You will find that information is lacking though for many of them. There simply isn’t enough research that has been done to give full details. Hopefully in time that will be information we have access to.